We decorate the Maidstone Exhibition Hall with tasteful Christmas trees and garlands to give a stylish atmosphere to start your Christmas shopping experience. Annabelle Jane Cake School will be presenting daily demonstrations. In 2018 we re-branded this event and changed several avenues of advertising, diverting the budget to new areas and presenting the event to specific areas of employment i.e. NHS, County Councils, local large businesses, offering special tickets and enhanced visitor experience. We were delighted to record a higher attendance of visitors and more importantly, a higher spend with exhibitors. Our visitors enjoyed the demonstrations and the new refreshment facilities keeping them at the event and increasing their spend. The event is staged in the Maidstone Hall which provides very comfortable surroundings, easy unloading and easily accessible wifi for sales. 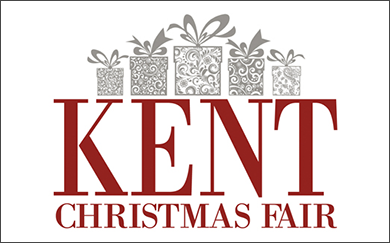 We decorate the event with a strong, stylish Christmas theme and ensure both our visitors and exhibitors enjoy their successful days in Kent. We have a large database of loyal visitors and will extend the successful advertising avenues used in 2018 to further increase the visitor numbers, keeping the high spending power as a priority. Our exhibiters reported excellent sales in 2018 and many have already booked sites for 2019, we look forward to another super year working with the very professional and friendly showground team making the whole event enjoyable and successful for our exhibitors. It is imperative that all food exhibitors have a stand that includes a back and side walls, we will install and charge you according to your stand size unless you inform us that you have a suitable stand.